Customize every process and launch your program in just a few minutes, no training or technical skills needed. Custom categories with individually assignable forms, sort your categories into main groups that expand when selected. Create submission forms with questions, text fields, links, videos, images, anything you need. Unlimited file uploads (all file formats supported) per submission, up to 20 MB each. Choose to allow one or multiple submissions per registration for your program. Applicants receive automatic emails upon registration, payment, cancellation, pending submission, successful submission, submission approval, submission rejection, submission shortlisting. You can customize these emails and schedule custom ones in a few clicks. Choose one of 40+ languages for a professionally translated customer experience in a single click. Accept payments the right way – fast, easy, secure. All currencies supported and the money goes directly into your merchant account! We support 160+ currencies and automatic conversions so you can sell virtually anywhere around the globe. Use your favorite payment gateway to receive money right away, directly into your own merchant account. Evalato supports 30+ cards, wallets and payment methods via the leading payment gateways Stripe, Braintree, and PayPal. 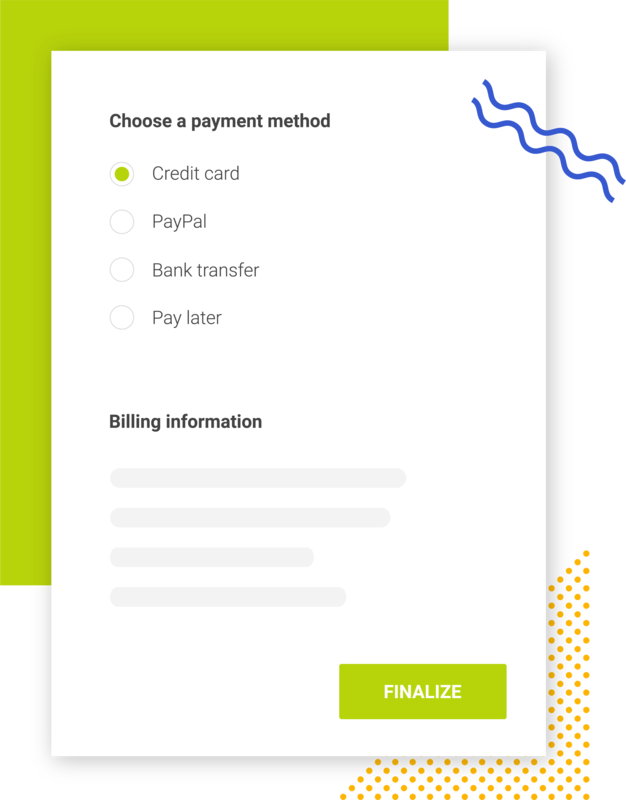 Accept all major credit cards, use many international and local payment methods including Alipay (China), Bancontact (Belgium), iDEAL (Netherlands), Giropay (Germany), Przelewy24 (Poland), PayU (India), ePay/EasyPay (Bulgaria). Set-up custom offline payment methods like bank transfer, cash, pay by invoice, pay later. Choose to make billing data optional or required, collect the information you need and issue invoices as easy as 1-2-3. Completely customizable tax settings for every scenario, add the tax within or on top of the price. Your brand matters the most. You have the freedom to customize the branding and styling of (almost) everything. Customize the registration form with the right skin, font and colors, so it fits the look of your own brand, site, program! No website? No problem – simply create a sleek web page for your program with Evalato in a few clicks. Embed the form into your website. Applicants stay on your site during the entire registration and don’t get redirected or asked to create an account with us. Your customers enjoy an excellent experience no matter what device they’re using – smartphone, tablet, or desktop computer. Upon registering for your program, applicants get a secure personal workspace to create, review, edit, and send in their submissions without hassle. Application progress can be saved and resumed at any time. Want to make your program public? Select which elements you want to show and what to keep hidden – submissions, ratings, individual scores, comments. 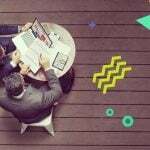 Evalato helps your programs grow. Enjoy up to 200% more conversions compared to other similar products, nothing comes even close! Persuade potential applicants into entering your program with dynamic visual notifications and our automated conversion triggers. Track unfinished registrations, export collected data and give it another shot at making these registrations happen! Everyone loves a good deal. Create special offers to give people extra incentive to buy and increase your sales. Attract new applicants with fully customizable promotional codes and loyalty programs for easy customer retention. Crossed out price feature to indicate an improved value proposition. Simple but amazingly effective. Superior convenience of use combined with our innovative registration and submission processes, means you’re getting more applications than ever. Applicants register for one or more categories to enter and fill in their details. Work on their submissions can be resumed, so they can send them at any point before the deadline you set. Each applicant gets a link to their own page to work on their submissions as much as they need to, whenever they want to. Creating, editing, and sending a submission has never been this fast, intuitive and user-friendly for your customers. Applicants can save their submissions and get back to them whenever… as long as they don’t miss your deadline, of course! Submissions can be previewed from the judges’ perspective, before being sent. A single click and the submission is sent for approval. No unnecessary steps or complicated procedures. Unrivaled customization and flexibility to create your programs’ evaluation process exactly the way it should be. Add multiple judging rounds, each with its own set of customizable rules! 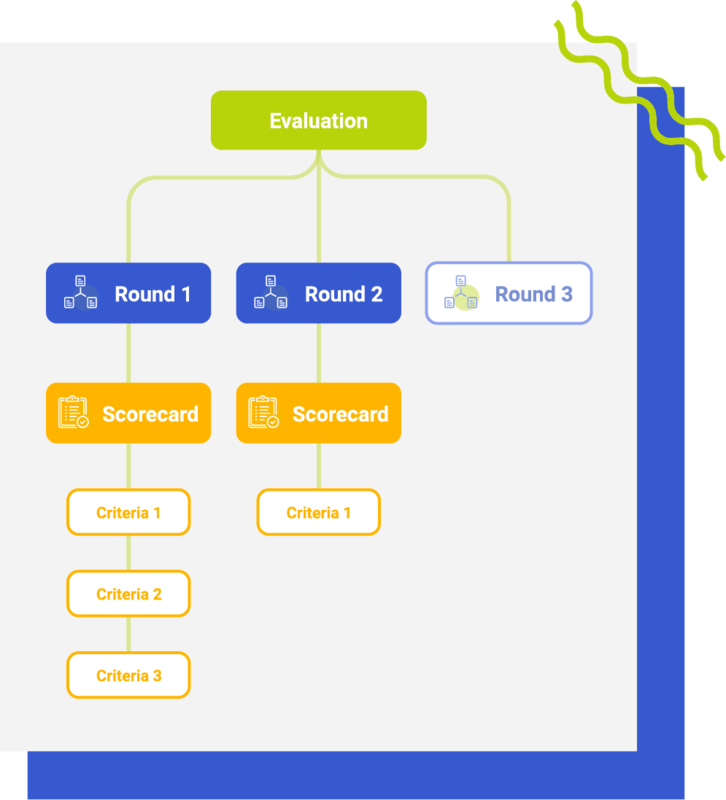 Set custom scorecards with various criteria for every judging round with different weight and rating scale. Easy approval process helps you decide easy and fast which submissions make it to the evaluation phase. Shortlist submissions directly to a judging round with just a click. Each judge can be assigned to one or more judging rounds and categories so you always have the right people on the job. Judging in Evalato is intuitive, fast, convenient and can be done from any mobile device or desktop computer. See information or delete an individual submission score given by a judge. Analyze the results of your efforts in great detail. Automate almost any task via integrations with 1000+ web apps and services. Real-time statistics and reports on key performance indicators keep you well informed on what works best. Easy integrations to help you track visitors and registrations in Google Analytics or Facebook. See information on judging progress, individual scores, and rankings across all submissions and categories. You are the sole owner of all data. Evalato simply compiles it for you, so it can be exported on demand whenever you need it. Evalato connects to 1000+ apps via Zapier, allowing you to automate your tasks, speed up your work, focus on what’s important to you! Highly scalable, lightning fast, mega secure and powerful. You will never have to worry about reliability when it comes to Evalato. Create and manage as many organizations and programs as you like, add as many people as you need to help with the workload. One-click program cloning allows you to create a new ready-to-go-live program in an instant. Lightning-fast search lets you find every registration or submission in no time, no more going through emails, folders, files, etc. Evalato is built with speed and reliability in mind, so you can do your job faster and with nothing to worry about. 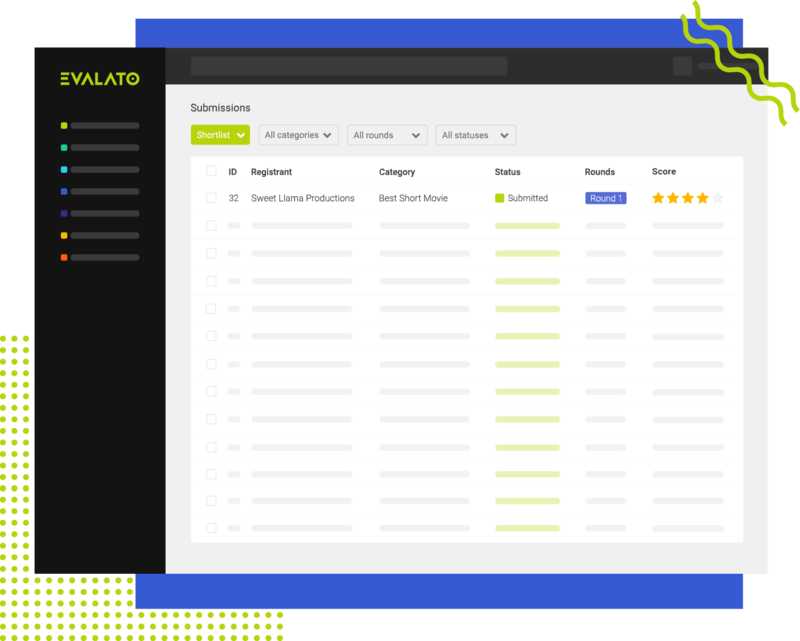 10 or 100 000 submissions, Evalato is highly scalable to accommodate programs of any size and lets you handle any amount of work with no extra effort. With Evalato you get a safe solution that has multiple layers of security and extra protection for your and your customers’ data. You alone own all of the program data, we don’t contact or market to your customers ever. All data is safely stored by Digital Ocean, Inc. in the Amsterdam (Netherlands) data center. The servers are monitored 24/7/365 for suspicious activities and to prevent unauthorized access. Information is highly restricted and can only be accessed by a senior support staff member, if you need our help. Data is backed up several times a day in multiple remote locations, so that in the unlikely event of data loss information is quickly restored. Evalato maintains an uptime of 99.98%. As you can see, we are clearly dedicated to keeping downtimes to a minimum. We use the latest SSL/TLS encryption protocols to protect your data and that of your customers. No credit or debit card information is stored on our servers. Your Evalato payments are processed by Level 1 PCI DSS Compliant Service Provider Braintree (a PayPal company). SendGrid maintains the email servers and infrastructure for all communication sent through Evalato, ensuring the highest deliverability and protection for your emails. Evalato is fully compliant with the EU General Data Protection Regulation (GDPR). You can find the Data Processing Agreement here.